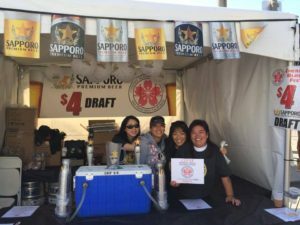 The 50th Northern California Cherry Blossom Festival is the largest Japanese culture festival on the west coast and that means there will be many exciting programs and amazing food. If you love food and especially Japanese food, then this is the festival for you. This year, the Food Bazaar is spectacular and is a great reason to go to the festival. So come hungry and try as many delicious Japanese dishes as you can. This is a crowd favorite and by far the most popular food to eat at the festival. The line can get long, but trust us, it is worth the wait. If you’ve never try takoyaki before, they are grilled savory ball-shaped filled with diced octopus (tako) inside and drizzle with Japanese mayo, and sweet and tangy takoyaki sauce and sprinkled with nori and shaved bonito flakes. 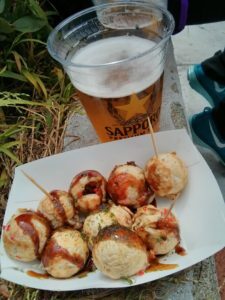 Takoyaki is the ultimate Japanese street food to try. 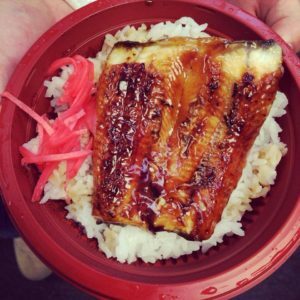 Unagi-Don is truly a comfort food meet haute cuisine in Japanese cooking. The unagi (eel) is grilled over charcoal low and slow to get that smoky, fatty and stickiness from the caramelization effect. Then the perfectly grilled eel fillet is brushed with a thin layer of sweet and salty teriyaki sauce and served over a bed of warm rice. This spam sushi is a great representation of Japanese-American fusion food. 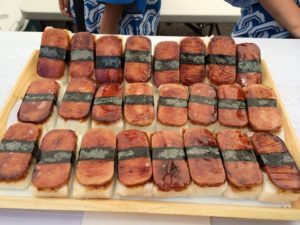 American GIs introduced Spam to Japan during the war and spam musubi was born. Spam Musubi is sort of a guilty indulgence. You feel bad eating it, but it feels so good when you do. And it’s the perfect festival food that you can grab and eat on the go! Udon is one of Japan’s beloved noodles besides soba and ramen. 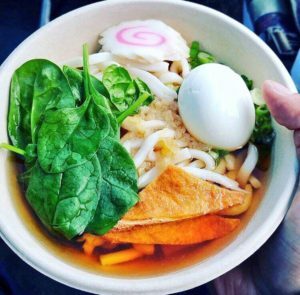 Why are we recommending a humble bowl of udon soup at the festival? Because it is happiness in a bowl kind of food. The slightly chewy noodles submerged in a bowl of warm dashi broth with ingredients like soft boiled egg, thin slices of beef or chicken or just vegetables. Trust us when we say this, when the fog rolls in, this bowl will warm you up and keep you going. Sushi, Yakitori – the Japanese style of skewered BBQ meat of all sorts, Wafu Dog – Japanese style hot dog with toppings like seaweed, green onions, and Japanese mayo, Gyozas (Japanese potstickers), fried rice, Niku Don (grilled beef over rice), Yaki Soba and Ramen too! 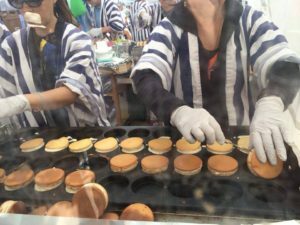 Let’s not forget the array of sweets you can get at the festival from mochi to Taiyaki (a crispy pancake sometimes shaped like a fish with sweet red bean paste filling inside), ice cream, shaved ice, waffles, and crepes! So make sure you save room for some desserts. By now are you getting a little hungry and super excited to try all the food at the festival? The good news is, the Food Bazaar continues to operate on the Grand Parade day on 4/16 so you can eat your way through the 4 days festival. The less than happy news is we might get rain on the first day of the festival. So bring an umbrella and wear your cute rain boots. Let’s not let a little rain dampen our spirit for the festival. There are plenty of programs that are indoors such as Rakugo, an Osaka style comedic storytelling and the Kayo Parade and others that you can take advantage of while waiting for the rain cloud to pass. So come to the festival hungry and leave happy in your tummy. See you all at the festival!